When we are busy, when we have deadlines to meet or goals to achieve, sleep is often disregarded and neglected. A culture of sleep deprivation and a negative attitude towards sleep has pervaded, with over 30% of adults aged 30-65 sleeping less than 6 hours a night . However, the scientific literature points in the opposite direction, with sleep quality having a key influence on cognitive ability, motor memory, metabolism, immune function, and mental health. Moreover, it has been found to have a direct impact on athletic performance, and susceptibility to injury. How sleep deprivation impacts the body? Many people assume that the only consequence of poor sleep is day-time sleepiness, resulting in a minor cognitive deficits. It is true that cognitive deficits are a problem, with an estimated 10-15% of fatal road crashes due to driver fatigue, and 100,000 deaths in US hospitals due to medical errors as a result of sleep deprivation . However, sleep also has many other effects on the body. In many studies, levels of white blood cells and antibodies in the blood have been found to drop, sometimes by as much as 80%, weakening the immune system and increasing susceptibility to illness . Obesity is linked to short sleep, due to elevated ghrelin (the ‘hunger hormone’) and decreased leptin (which signals satiety) . Sleep deprivation has also been found to impact risk of coronary heart disease and hypertension, with a 45% higher risk of fatal heart attack for someone that regularly sleeps less than 5 hours a night . Remarkably, the brain mechanisms underlying sleep, such as the serotonergic system, have been implicated with mental health disorders including depression and schizophrenia as well as neurodegenerative diseases . Clearly, sleep disturbance has a much more significant impact than many people might imagine. Increasing numbers of studies are finding direct associations between sleep and exercise performance. A study at Stanford University found that extending sleep of collegiate basketball players by an average of 110 minutes for 5-7 weeks improved sprint times, shooting accuracy, reaction time and mood , and another study found that partial sleep deprivation had significant effects on weight lifting performance after just two nights of low sleep . Endurance performance has been found to be affected after lack of sleep . Emotional well-being is particularly susceptible to sleep quality and with sleep deprivation leading not only to disruption of mood states but also increased pain perception . Reduced injury rates are also associated with sleep quality: Sleep deprivation is a strong predictor of injury in adolescent athletes, highlighting the risk of over scheduling and leaving inadequate time for rest and recovery between training or competitions [11,12]. One study even suggests that poor sleep quality can result in autonomic nervous system imbalance, simulating symptoms of overtraining . Sleep is a key component for physiological, biochemical, and cognitive restoration and recovery. In addition to this, improvements in motor skill performance following practice are boosted by sleep, with a study finding a 20% increase in motor speed, without loss of accuracy after a night of sleep compared to an equivalent time awake. Indeed, with the sleep-dependent modulation of long-term synaptic plasticity providing a possible explanation for the gains in athletic and motor performance. There is a plethora of information provided by clinicians and scientists regarding managing and improving sleep; some key points are outlined here. The use of sleep hygiene practices has been found to be an important predictor of sleep quality. These include sleeping and waking at regular times in order to match the body’s circadian rhythms, ensuring that this includes sufficient sleep (>7 hours, and preferably 8-9 hours in the periods of high training volume or during tapering for important events), and reducing light levels in the evenings. Since sleep onset is associated with falling body temperature, and warming the skin, for example with a warm shower, has been found to increase loss of heat from the skin, helping to induce sleep . Avoiding alcohol and caffeine is also important. Caffeine is a well-known negative influence on sleep quality due to its action as a stimulant, and should be avoided in the late afternoon and evening. Alcohol is often seen as a sleep promoter, but despite promoting the onset of sleep, it interferes with sleep quality by reducing the quantity of REM sleep at the beginning of sleep, and later resulting in frequent waking, thus resulting in increased fatigue . Napping can improve cognitive performance and reduce sleepiness, however it is typically recommended not to nap for longer than 45 minutes so as not to induce further sleepiness . Although it can be beneficial to use wearables or one of the available mobile apps to track your sleep, it has been suggested that self-reported measures of sleep duration show a very large positive correlation (r=0.85) to actual sleep durations. This makes Wattson Blue an excellent non-invasive tool for tracking sleep. This makes Wattson Blue an excellent non-invasive tool for tracking sleep. Every morning that you use Wattson Blue, you answer two questions about your sleep quality and duration, allowing you to reflect on the quality of your recovery from the day before. Over time, you can see how sleep affects your personal performance, mood and other metrics such as HRV (chronic sleep deprivation has been found to reduce heart rate variability ), helping you to adjust your training and improve outcomes. 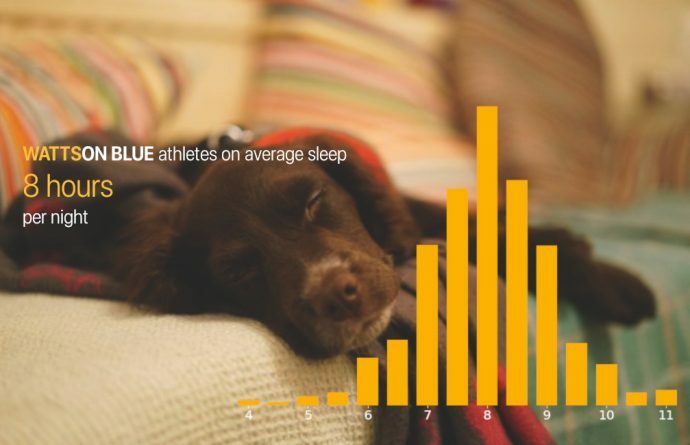 Over the past 4 months, Wattson Blue athletes have slept on average of 8 hours a night, although many of our top athletes generally sleep longer than this. Moreover, we have found that improved feedback within the app has led to an increase in average sleep duration: Over the past 4 months Wattson Blue athletes on average slept 25 minutes longer than the same period a year earlier. Download Wattson Blue today, and start tracking your sleep and other recovery metrics today.